Susan Kerin, a Derwood resident and a human rights activist, said the county has “dodged a bullet” by delaying the process. Meanwhile, the county’s Commission for Women and the Commission on Human Rights are meeting in upcoming weeks to discuss the sister-city agreement. On Wednesday, the county’s Committee on Hate/Violence, of which Kerin is a member, held a conference call on the issue. Kerin’s objection to Bet Shemesh was leveled on feminist grounds – the treatment of women in that town. If we go back to Gondar for a moment, no similar objection has been raised on the grounds that FGM may be widely practiced there. Clearly, what we are seeing is a false flag operation. There is an attempt to block a sister-city agreement with an Israeli city using the issue of the mistreatment of women by a tiny extremist ultra-Orthodox group as the lever. This campaign has taken place despite the voluminous reports that virtually every Jewish community in Israel, including ultra-Orthodox and Orthodox Jews, has roundly condemned the violence and discrimination against women in Bet Shemesh and the little girl who was spat upon, women including leading female politicians have held flash- dances in the city to demonstrate their opposition to the perpetrators, there have been massive parades in the city to express opposition and disgust towards the perpetrators. From Shimon Peres and Benjamin Netanyahu down, the clear message has been that these acts towards women will not be tolerated. So who is Susan Kerin, and why is she so concerned about feminist issues in Bet Shemesh, while not raising such concerns in the cases of Ethiopia, El Salvador, China, or Ukraine? None of those places is known as a beacon of light on the issue of women’s rights. We have learned from the way the Guardian hides the true agendas of its contributors to peel back short bios that hide so much (“a Derwood resident and a human rights activist”) and look at the track record of those opposing Israel. This month, Montgomery County will enter into a sister-city relationship with Beit Shemash (sic), Israel, where the events described in the Dec. 28 news story “Religious limits on women roil Israel” were centered. For several months, local peace and human rights groups have been trying to schedule a forum to discuss our concerns about the selection of that city from a human rights standpoint. County officials initially told us our concerns were without merit. One hopes that our county decision-makers might now be more open to a dialogue after reading The Post’s report, which indicates that even Israeli citizens take issue with the hate violence and discrimination taking place in that city. This is not a sisterhood that reflects the diversity and tolerance of Montgomery County. The writer is co-chair of Pax Christi at St. Francis Catholic Church in Derwood. Next week, for example, my hometown of Washington, DC will host two Holy Land visitors. The warrior, Knesset Minister Benny Elon, will arrive with a hero’s welcome on Capitol Hill as keynote speaker for a reception to launch Congress’ newly formed “Israel Allies Caucus.” Sponsored by several members of Congress, invited guests will include prominent political figures and national Christian leaders. In contrast, Reverend Naim Ateek, the Anglican-Palestinian pastor who founded Sabeel, a nonviolent faith-based liberation movement, will also arrive here that same week and his small but loyal supporters have arranged a modest lecture at a local university and perhaps a lunch with some local pastors. It’s not that Rev. Ateek is reluctant to meet with Congress or prominent Christian leaders in the West. It’s just that, as a peacemaker, he is not well-known in these circles. My hometown is, after all, the global headquarters for Pax America. And Ateek, who was raised in Nazareth, advocates a different Way towards peace, one that is based on the teachings of his town’s most prominent native son… In contrast, Rev. Ateek would be able to provide these influential listeners with very intimate insight on the implications of such a plan, as he and his family were victims of the 1948 expulsions known as the Nakba…. Susan Kerin, an American Catholic residing in Rockville, MD, served as a 2006 peace delegate with the Christian Peacemaker Teams (CPTs). She is the author of the soon-to-be-published book “Prophecy Interrupted” on Christian Zionism. Sabeel is a virulently anti-Israeli organization headed by Dr. Naim Ateek who is far from being a “peace-maker”. Incomprehensibly, Israel allows Sabeel to remain headquartered in Jerusalem. Sabeel thrives on infiltrating Christian churches, particularly the Presbyterian Church of the USA and the Toronto-based World Council of Churches to promote its anti-Israeli agenda. Every two years an anti-Israeli hate-fest under the guise of promoting peace in the Middle East (at least that part that includes Israel!) is organized by a determined leadership group presenting anti-Israeli position papers at the biennial Presbyterian General Assembly. Sabeel is a founding supporter of the Kairos Document (which calls for a one-state solution) issued under the umbrella of the fervently anti-Israeli, not to say anti-Semitic, Toronto-based World Council of Churches. Its organization in the USA is FOSNA – “Friends of Sabeel – USA”. FOSNA’s “beloved patron” is none other than Archbishop Desmond Tutu, notorious for his accusations of apartheid hurled at Israel. IsraeliNurse and I have written several times of Palestinian Christians’ malign influence on the Anglicans, Wesleyans, Methodists, and Presbyterians, and the way Sabeel has captured the leadership of these churches despite the objections of large numbers of their members. The method of small leadership groups staking out anti-Israeli positions before the people they represent realize what has happened is reminiscent of the same tactics used in the UK by small determined leadership groups of the academic and trades unions. 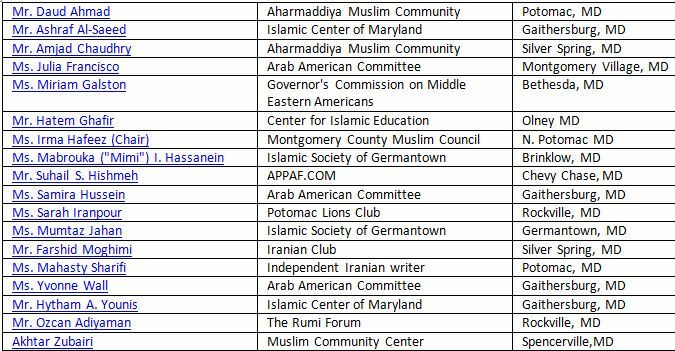 Via Pax Christi Sabeel appears to have infiltrated the Catholic Church in the USA as well, and via the possibly well-meaning but naïve Ms Kerin, is now using the concept of women’s rights to try to prevent Montgomery County from concluding its agreement with Bet Shemesh. Women’s rights are not famously well-protected among the Palestinian Christians – Muslims in Jordan have even accused Arab Christians as perpetrating a higher per capita number of honor killings, for example, than their Muslim neighbors. The Free Gaza Movement has volunteers all across the world, available for media interviews and local coordination. In order to expand outreach, help spread information about our efforts, and get as many people as possible involved within their localities, the Free Gaza Movement encourages the establishment of local FG affiliates everywhere in the world. 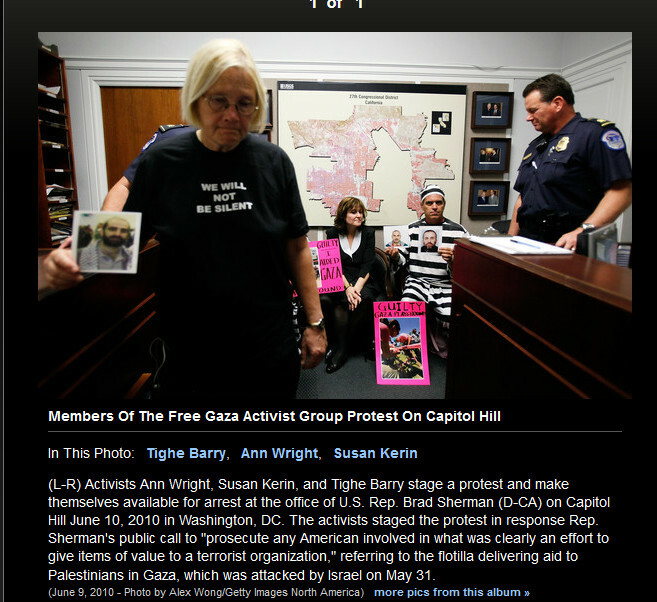 And here she is staging a protest on Capitol Hill: http://www.zimbio.com/photos/Susan+Kerin . Adams, a political ally of Leggett’s, said the nonprofit board [Montgomery Sister Cities, the nonprofit group that was set up by Leggett ]has proposed a public meeting on Beit Shemesh in late March. The board is also inviting the Middle Eastern American Advisory Group, a county committee that was contacted by Kerin’s group and expressed concerns in December about the sister-city agreement. 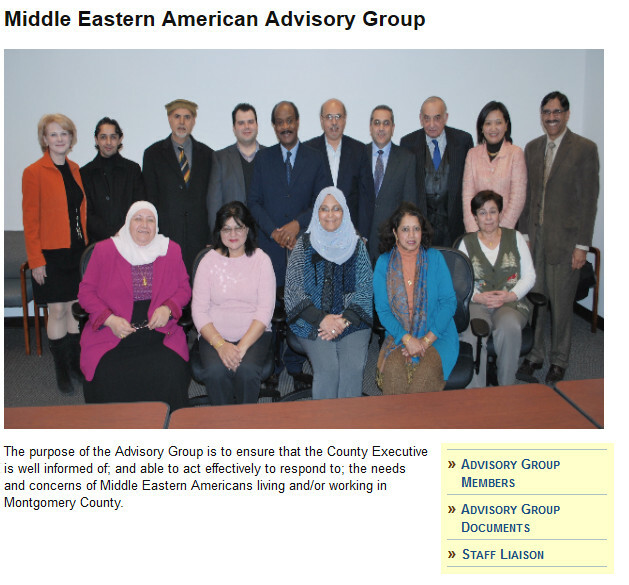 Who are the members of the “Middle Eastern American Advisory Group, a county committee that was contacted by Kerin’s group and expressed concerns in December about the sister-city agreement”? It is a joke to consider that this is the group, which has no representatives of a certain Middle East country among its members, that is concerned about women’s rights in Bet Shemesh! It is not difficult to believe that for many of its members their concerns lie with the very concept of a relationship with any Israeli city, or with Israel at all, rather than the attitude of ultra-Orthodox Jews in Bet Shemesh to Jewish women. To sum up, one would have to be particularly obtuse to accept that the argument that Montgomery County should not form a sister-city alliance with Bet Shemesh is based on the issue of the mistreatment of women in the city. Despite the fact that such mistreatment has been roundly condemned by the majority of Bet Shemesh’s citizens and Israelis, the issue of women’s rights is being used by a determined activist whose anti-Israel support includes Sabeel, Free Gaza, Electronic Intifada, Pax Christi, and this Middle Eastern American Advisory Group as a lever to delegitimize any contact at all with Israel. The Bet Shemesh issue was simply a convenient lever for a pro-Palestinian, pro-Gaza, pro-Sabeel activist to use against a County Council that doubtless has other things to worry about than what lies behind the curtain of half-truths and posturing that has been laid before it to hide her true anti-Israeli agenda. One can only hope that the true nature of this carefully coordinated attack on Israel will be laid out before the Council before its meeting in late March and possibly influence the weight it ascribes to the motives of Ms Kerin and her pro-Palestinian supporters. I see by this woman’s photo that she is no spring chicken. She’s old enough to know better. This is a hardened ideologue who is not fond of Jews. Yes. One can smell the extremists. They will prioritize certain negatives in Israel’s society over all that is positive in Israel’s 65 year existence while carefully ignoring deeply implemented prejudices and abominations in Arab/Muslim societies. I don’t mind Israel being held to much higher standards than Islamic/Muslim societies but it should not be held to standards that no other country/society can be said to maintain.